"While there are people who have a large number of Twitter followers, what's important is that we have large numbers of votes on the floor of the House," Pelosi said, without singling out AOC by name. In a hilarious turn, according to a new poll, President Trump now has a higher favorability rating among New Yorkers than socialist darling Alexandria Ocasio-Cortez. "What good are your thoughts & prayers when they don't even keep the pews safe?" Apparently, Ocasio-Cortez doesn’t think Pelosi’s comments actually rule out impeachment. Funny, because the only garbage I see here is what’s coming out of her mouth. Ironically, AOC herself has been an outspoken critic of "dark money" in politics, vowing to increase transparency in campaign funding. It's not modern, and it's not a deal. It's inflationary, destructive, and a very old idea that has always failed. She can't possibly be this dense....can she? 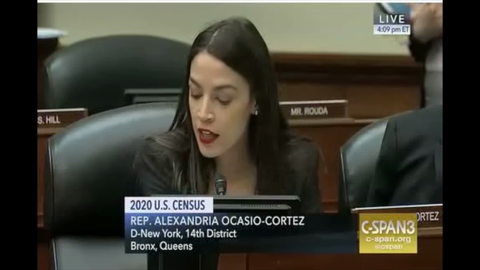 New York Rep. Alexandria Ocasio-Cortez doesn’t just want to take your hamburgers, cars, electricity and airplanes – now, she’s questioning whether you should ever have kids. Here's her speech, in case you have four minutes of your life to waste watching your own brain dribble out of your ears. “Well she's got a target on her back because she ticks every box that makes conservative men uncomfortable,” Bassett proclaimed. Recently elected Congresswoman Alexandria Ocasio-Cortez thinks it doesn’t much matter much if she gets her basic facts correct – so long as she's “morally right" in the end. None of that includes other taxes such as sales tax, personal property taxes, capital gains taxes or the death tax. Someone get the popcorn, because it’s about to get good.